More recently Professor Middleton and Associate Professor Wainwright have collaborated with colleagues from the Faculty of Science & Technology at Bournemouth University to publish a review of the current literature on virtual reality based training in orthopaedic surgery. 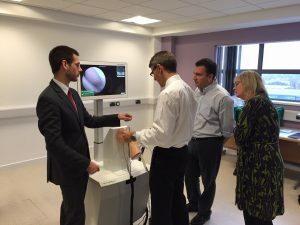 Further work on the use of virtual reality training simulators in orthopaedics continues within ORI and with academic partner from the BU National Centre for Computer Animation (NCCA), and also leading industry partners. ORI is in collaboration with Virtamed in Switzerland and OSSIM Technologies in Canada in order to develop world leading virtual reality trainers. ORI has the only lab in the world to have both simulators and the only OSSIM technologies knee replacement outside of North America. Current research and educational projects on the simulators include the vital clinical validation studies required to further develop the simulators, so that they may be adopted into mainstream clinical practice.